A FREE Professional Development Experience for 8th – 12th grade science teachers. Hands-on, real world, and STEM-based experiences will be emphasized – be prepared to get wet, sandy, and re-energized! 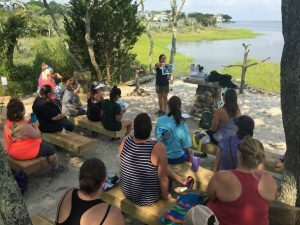 During this four day teacher institute, 8th -12th grade science teachers will explore and compare several unique coastal ecosystems through inquiry-based, hands-on activities, evaluating human impacts on these systems alongside scientists and expert environmental educators. 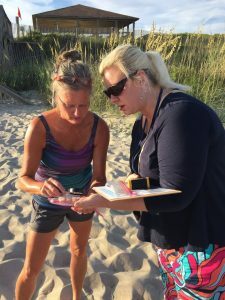 Teachers will gain updated content knowledge and instructional resources designed to foster student learning of watershed science and stimulate awareness of actions that promote watershed stewardship. Content and activities are aligned with the NC Essential Standards for 8th Grade Science, Earth/Environmental Science and AP Environmental Science. Actively participate in hands-on and STEM-based experiences in North Carolina’s coastal aquatic ecosystems. Engage with a variety of outstanding environmental educators, researchers and scientists. Gain knowledge about current watershed science, human impacts to coastal watersheds and strategies to protect watersheds. A wealth of new ideas and instructional resources including curriculum-related materials. An opportunity to network with colleagues in a relaxed professional development setting. Excellent food and lodging at beautiful Trinity Center in Salter Path, NC. CEU and Environmental Education Certification Credits. Commit to the entire institute. Share their experiences and mentor other teachers in your school or system. Incorporate learned skills and experiences into lesson plans and teaching practice. Be in good physical condition. Activities will include hiking, walking, wading, etc., in potentially hot, humid conditions. The Institute will begin at 11AM on Monday, July 8, 2019 and end by 2PM on Thursday, July 11th. Lodging provided Monday, Tuesday, and Wednesday nights. Meals provided from Monday lunch through Thursday lunch. There are a limited number of seats available for this Institute. All applicants will be notified of their acceptance status on or before May 15, 2019. If you are accepted, a $100 refundable deposit will be required to reserve your spot. Your spot will be forfeited if your deposit is not received in a timely manner. Your check will not be deposited and will be returned to you upon check-in at the institute on July 8. Cancellations made after June 21, 2019 will result in the forfeiture of the deposit; your check will be cashed and considered a tax-deductible donation to the UNC Institute for the Environment. 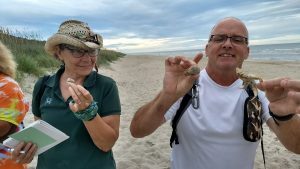 The institute is presented by the UNC Chapel Hill Institute for the Environment’s Center for Public Engagement with Science, with funding provided by the Albemarle-Pamlico National Estuary Partnership (APNEP).